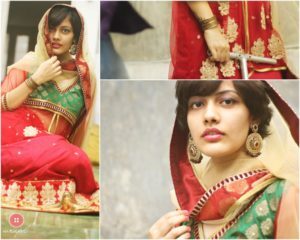 We strongly sympathise with every girl’s efforts to look flawlessly perfect in a designer lehenga. If you are the one shedding extra Kilos in a gym and only living on salad/fruit diet, chill girls! we have come up with some of the best life-saving tips to help you look super gorgeous in a lehenga this wedding season without worrying about your body shape. Ditch body-fitting mermaid lehengas and go with an A-line lehenga to flaunt your slim back without drawing focus to your wide bottom. Short sleeves and deep neckline are a big No! No! Go for quarter sleeved or full-sleeve blouses to get lean arms. A lehenga with heavy embellishments make you look bulky by adding volume to your entire body frame, Choose a lehenga with narrow borders and light work to flaunt your curves beautifully. Dark colours provide the illusion of a lean look hence stick to dark hues such as navy, maroon and black to do away with your problem areas. Pastel colours will only end up spoiling your look. Satin and velvet are body-hugging fabrics and hence should be avoided at all costs. Instead, opt for flowing fabrics such as silk-blends and chiffon for an elegant appearance. A feasible option to look classy this wedding season without spending huge money is to rent lehenga from Wrapd. We have a massive collection of ethnic wear for both men and women and you can rent shewani or lehenga at surprisingly low market prices. Wedding season will soon arrive with a bang with all its splendour, colour, glitter and most important – Fashion! Every wedding season, a new clothing trend hits the bridal market and makes you covet to flaunt that heavy work and so gorgeous Manish Malhotra sherwani in your friend’s wedding. 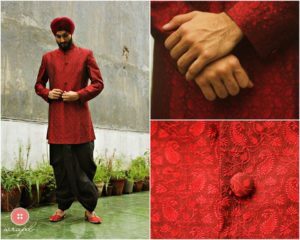 While reputed markets across metropolitans of the country are filled with numerous sherwani designs, grabbing one that suits your body type and makes you noticeable is a time-consuming task. While on the other hand, Wrapd offers you the luxury and convenience of browsing our latest collection of design-led Bollywood sherwanis you can rent at a fraction of price as compared to buying one. • You get to wear a trendy ethnic wear on each new occasion. • No trouble of dress storage and dry-cleaning. • Exclusive range of both Ethnic and Indo-Western sherwanis to choose from. • Custom-fit dresses to perfectly fit your body shape. Wrapd has a sherwani to suit each body type, colour and taste requirements. There is amazing collection of light work elegant sherwanis too for men who like to keep it simple while those having a liking for heavy embellishments can choose from a huge range of designer embroidered sherwanis. You can rent sherwani from Wrapd in Delhi, Hyderabad, Jaipur, Mumbai, Chandigarh and Bangalore. Browse online or visit our stores in Delhi, Hyderabad or Jaipur to get a sherwani on rent and make a fashion statement without spending huge bucks!! !